TONASKET — I have great admiration and respect for people who build their businesses from the ground up and succeed through dogged perseverance, creativity and a can-do mindset. 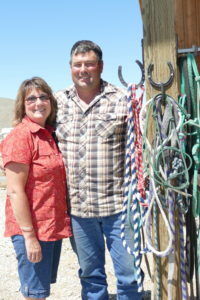 During a tour of the Okanogan recently, I had the opportunity to get acquainted with Derek and Noreen Olma, who started their ranching career in the late 1980s with virtually nothing — just three cows and without a pickup. They have built turned that into successful family cow and calf enterprise near Havillah, situated in a picturesque valley north of Tonasket. 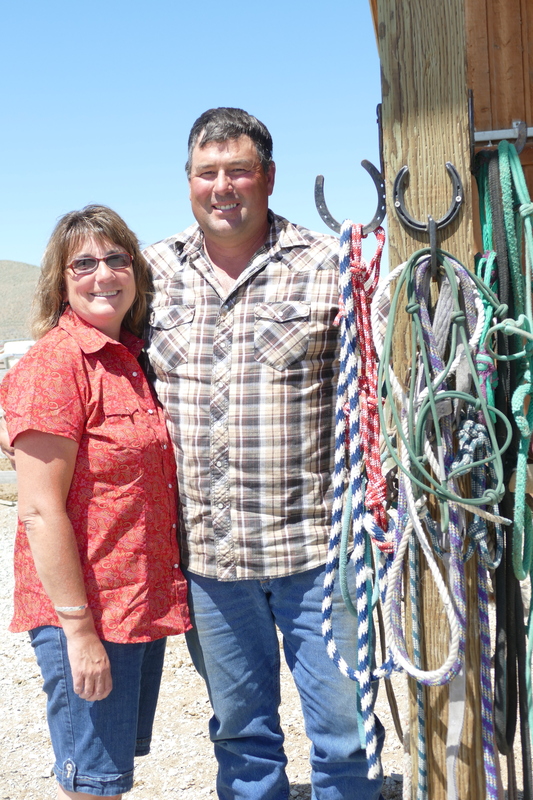 OC Ranches is quite the family affair, with the Olma’s son Austin running the livestock part of the operation and son-in-law Trend Rodgers handling the agricultural side of things. Noreen, daughter Shelby Rodgers and daughter-in-law Nadine Olma all have outside jobs — a common practice in agriculture families to smooth the financial edges. Today, the Olmas own about 3,000 acres and lease perhaps 50,000 acres more, Derek told me. They are committed to agriculture, the community and their family. They are secure in the knowledge that their property will be maintained as agricultural land forever rather than be broken up and developed like so many similar ranch operations in this part of the county. To achieve that goal, the Olmas sold the development rights to their property via a conservation easement to the Okanogan Land Trust. By doing so, they voluntarily gave up the possibility of carving up the land into 20-acre parcels for view homes and thereby permanently reduced the value of the property. The Olmas were not interested in maximizing wealth on the land they own but decided that they want the land they are working to be used for agriculture in perpetuity. Money is important but it’s not everything, Derek told me. The land here is uniquely suited to raising cattle, with lush grasses filling meadows as far as the eye can see. Not so many years ago, the Northeast part of Okanogan County was home to numerous big ranching operations, but development has substantially changed that. Agriculture is everything to the Olmas. The two of them grew up in Canada and met at a 4-H camp when they were 17 years old. He didn’t have a farming background, but her father was an Angus breeder. They moved to the Okanogan in 1986 and worked some leased land on Antoine Creek, financed by a family partnership. Over time, they saved enough to buy land near Havillah from another family — a choice piece of ground that is meticulously cared for. 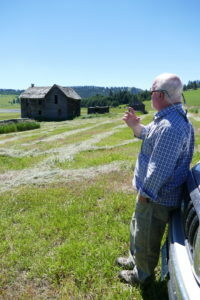 Okanogan Land Trust Executive Director Jerry DeBacker said the Olmas and other ranchers in the Okanogan are the best land stewards he has ever come across in his 20-plus years of conservation work. He was kind enough to make the introduction to the Olmas. Derek is humble about the success they’ve had. “I’m really fortunate that I get to work with my son and my son-in-law,” he said, adding, “I get to give them a hard time,” he said with a laugh. His wife concurs. “We have an amazing life,” she marveled. She runs the lab at North Valley Hospital but feels it is a privilege to come home and have agriculture at her doorstep 365 days a year. “It gives me comfort to know that this land is going to be here to produce” forever, she said. Friends who don’t know much about the financial realities of agriculture sometimes think they live a stress-free life, she told me. “I tell them it’s not all roses and buttercups,” Noreen said. Life in agriculture means hay gets ruined or burned, calves bloat and die and equipment breaks down at the most inopportune times. Noreen and Derek built their enterprise piece by piece, finding themselves financially stretched at times and working to figure out how to make it work. The secret, Derek says, is that they just kept plugging away. “It gets scary at times,” he admitted. Four years ago, when they bought the property, they built their first home. They had always rented before. Such is the life when you’re building an agricultural enterprise from the ground up. The Olmas don’t begrudge fellow ranchers who choose to maximize their land by carving it up into 20-acre parcels. People have to live somewhere, Derek told me. But they see a disturbing trend of people moving to the valley and then not taking care of their property or wanting to restrict agriculture. That doesn’t sit well with him. I came to greatly appreciate the sense of obligation they feel to be contributing members of the community. Noreen is as passionate about the value of North Valley Hospital and its mission to serve the community from birth to the end of life as she is about agriculture. Development pressures are heating up in North Central Washington and it will take collaboration to ensure agriculture remains viable here. We need to make it possible for the Olmas in our region to keep productive land in agriculture.